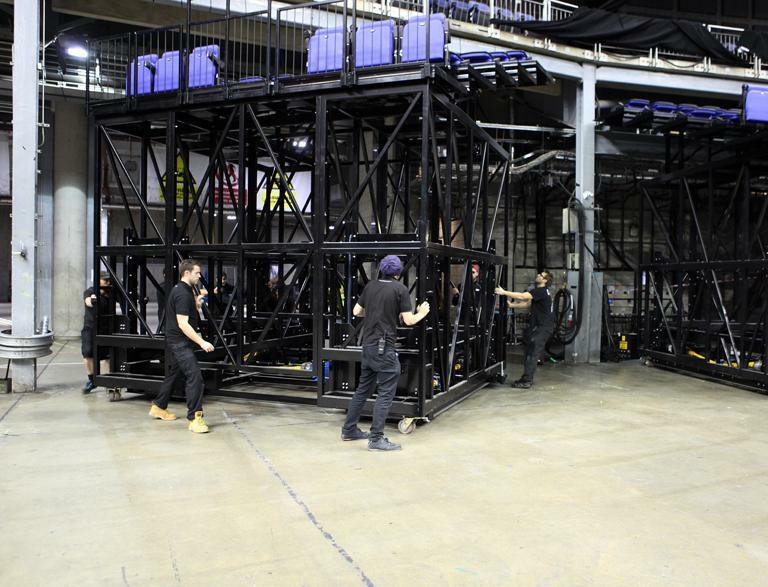 Audience Systems worked with the O2 Arena to devise a ground-breaking solution for the Arena’s South end. The South end is normally occupied by the stage, but a few times a year, when the arena takes on an “in the round” set up, 24 rows of tiered seating have to be brought into the arena and installed. Larger mobile seating structures always need to be designed with extreme care and expertise, but in this case there were some additional complications. 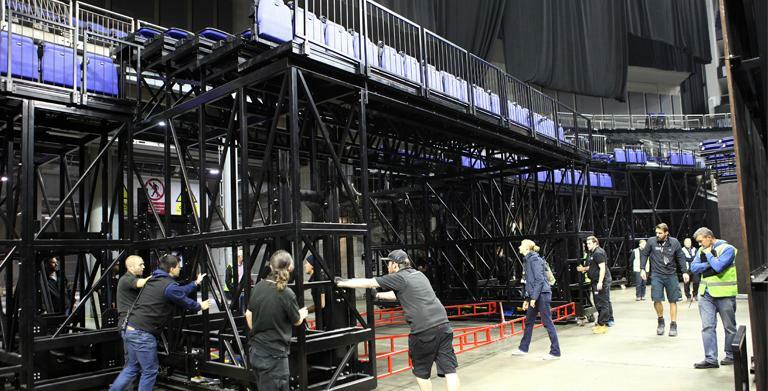 Firstly, the doors into the arena were lower than the height of the required seating structures. Secondly, for WWE wresting, the South End was to be home to the wrestlers’ entrance. In this set up, only the top five rows of seating would be in place, supported above a sizeable opening in the structure, 6.5m wide and 4.5m high. 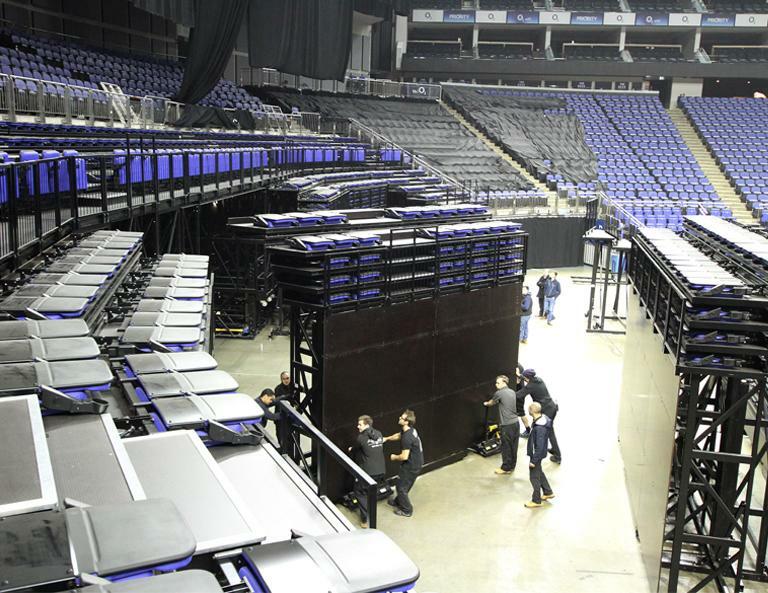 Not only were the O2 Arena’s existing South End seating structures not suitable for wrestling set ups, they were also difficult and time consuming to set up, taking eight men around 24 hours. The rear sections were rolled in with the tiers of seats stored inside them – the seating rows then had to be forklifted onto the structures – a lengthy task to achieve safely. In order to present a fresh solution to these challenges, Audience Systems divided the seating into a number of parts from back to front. The uppermost, rear rows of seating are simply rolled into the arena in modular sections. However, in order to “duck” under the arena doors, the supporting structure of each module is height adjustable. 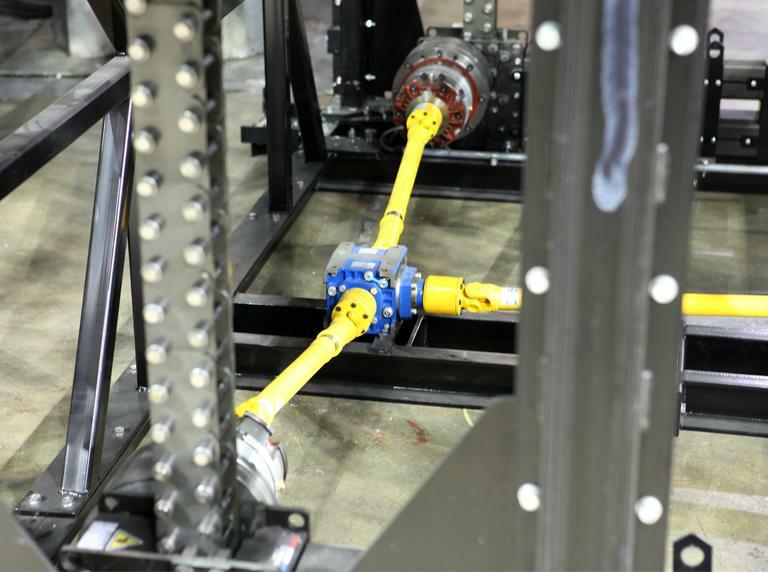 Each is fitted with a rugged chain-driven motor, and once in the arena, can be brought up to the correct height with a hand controller. The central section incorporates the wrestlers’ entrance and is carefully engineered to support five rows of seating above the opening. When the wrestlers’ entrance is not required, the next 14 rows of seating can be placed in front. These are formed from mobile retractable platform systems, with each section divided into a front part and a back part. Splitting the retractable platforms in this way increases both their manoeuvrability and their stability. If all the rear rows of seating are already in place when the retractable seating is to be brought in, the height adjustable wrestlers' entrance can be raised a little more to allow the retractable units to pass underneath. The final five rows have a very low rake and are formed from a low row rise retractable system. As the row height is not sufficient to store the chairs inside, Matrix removable chairs are fixed to the top after the rows have been opened. 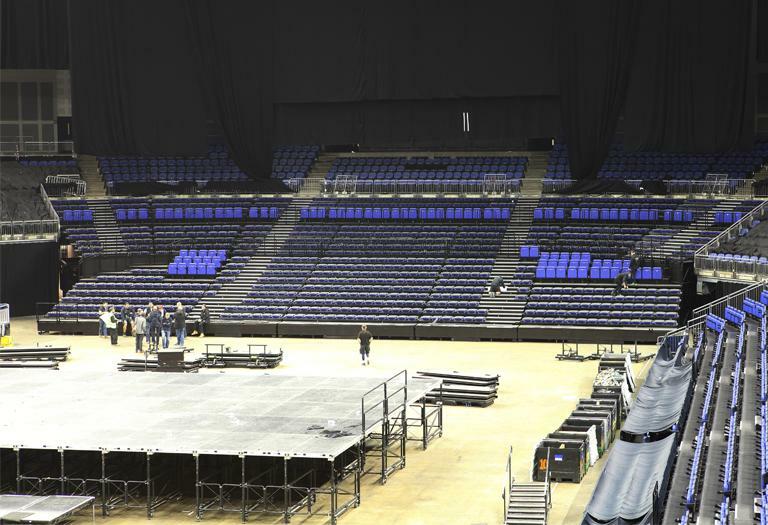 The structures and platforms are fitted with high specification Espace 628CC chairs in the special configuration Audience Systems have already used for thousands of other chairs in the arena. The chairs incorporate cup holders, thick seat foam, and a supportive high back. They are upholstered in the O2 Arena’s signature Design Tex Staples Twill fabric with plastic wraparound cover to the rear for additional durability. The entire set up process for the O2 Arena's South End has now been reduced from 24 hours to around 8; allowing the arena to potentially use a full bowl configuration more frequently and with less cost and disruption.